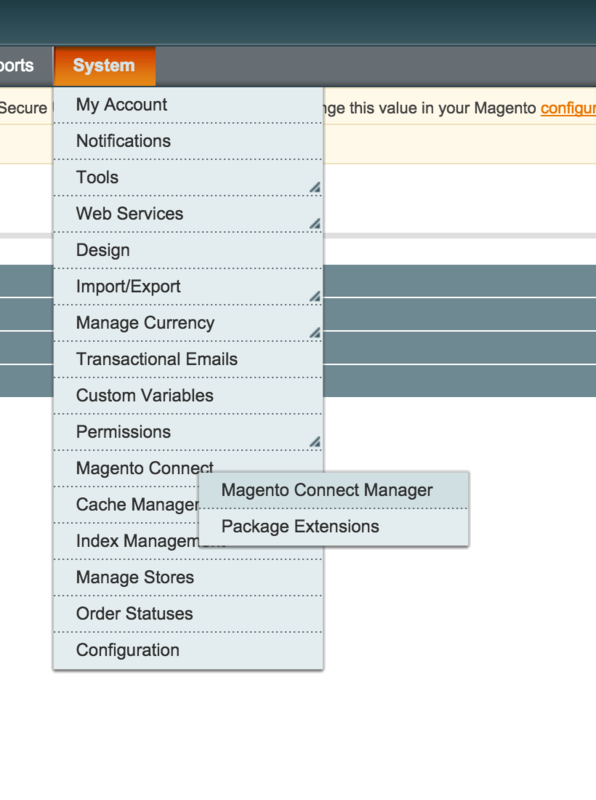 ZAIUS connects directly to your Magento instance using the ZAIUS Magento Connector. Follow the instructions below to enable the connection and start receiving live data. Click 'Upload', you will see a log on the bottom of the page detailing the installation process. Once that is complete, the connector is installed. On the left-hand menu under the 'Sales' category, you will see a Zaius Engage Option. Click that. Paste your Tracking ID into the specified text box, and click save. 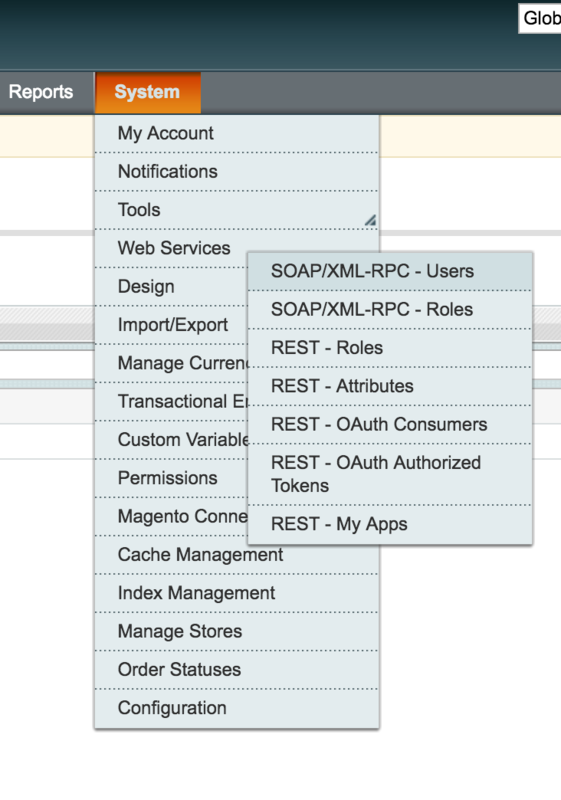 In order to use Magento with Zaius, a user with SOAP API permissions must be created. To do this, navigate to System > Web Services > SOAP/XML-RPC - Users and create a user if one does not already exist. This user must have permissions to use the Zaius Engage API to retrieve data from Magento. To ensure the user has appropriate permissions, navigate to System > Web Services > SOAP/XML-RPC - Roles to assign appropriate permissions to the user. Zaius Engage provides a custom API that is used during the initial import of customers, products, and orders. 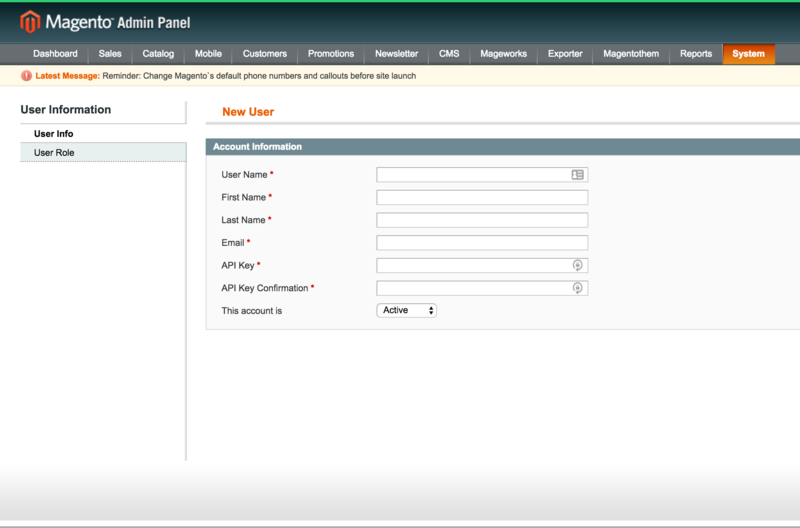 Enter the username, API key and the URL endpoint on your server into the boxes found in the integrations screen in the Magento box. The API URL is typically of the form: "http://your-magento-server/api/v2_soap?wsdl=1"
Zaius Engage provides a set of configuration options for the plugin. Cart Abandonment Secret Key -- This is a secret value used to encode link information for cart abandonment campaigns. Once set, this should not be changes. This is a random string that you enter in and is not something Zaius provides. Zaius Schema Update & Zaius Batch Updates - these are optional but recommended tweaks. For more information see "Configuring Batch Updates" below. Other settings should be left to the default unless your customer success manager recommends a change to them. Many Magento sites have a variety of backend processes which run direct SQL inserts and updates, especially ERPs. When the Magento database is modified via direct SQL, Magento's Observers don't know that there are updates to inform other technologies (like Zaius) about. This can cause those technologies to desynchronize from the Magento dataset. To account for this, Zaius has built a Batch Update module which lives in Magento. This feature causes Magento to regularly look through the database to find those products, customers, and orders which have been updated since the last time it scanned through. Navigate to the Zaius Engage configuration page. In the Zaius Schema Update panel, click "Run It!" to make necessary modifications so that the batch process can know which entries need to be synced. This adds two columns to the database tables which Zaius syncs, zaius_created_at and zaius_updated_at. In the Zaius Batch Updating panel, change the Crontab line to indicate how frequently you would like the updates to be run. More frequent updates mean that each update takes less time to process, but each time we're scheduled to update a small query will be run against the database to determine if there is anything which needs to be synced. Zaius recommends either a high frequency update (eg "*/5 * * * *" meaning every 5 minutes) or a daily batch at a low-traffic time (eg "0 1 * * *" meaning at 1 AM as indicated by your Magento server's clock). Make sure to set the "Enable/Disable" option to "Enable". Many Magento sites support multiple language/currency code combinations, and create each one as a separate store_view. Zaius has added support for this workflow. The Zaius Localizations feature in the Zaius Engage module adds support for such sites. The feature automatically detects those store_views configured as localizations and sends additional, localized versions of products. 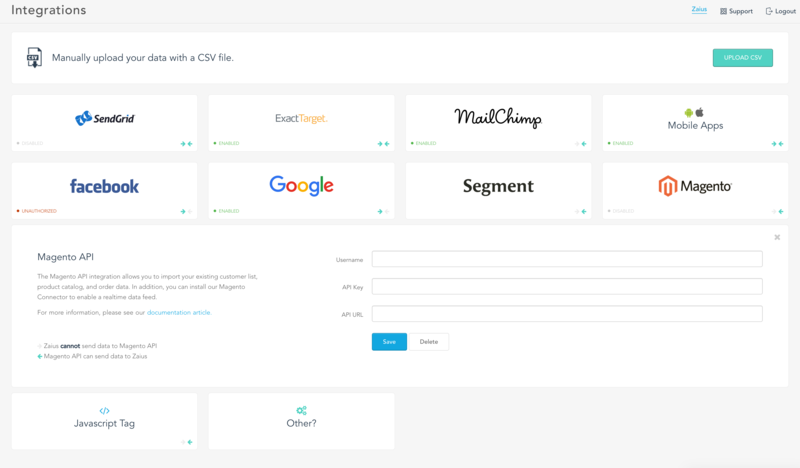 These products provide all information necessary to generate dynamic product grids in your customers' preferred languages, even when the products shown are not necessarily products they have explicitly interacted with. At this point in time this feature is in a beta phase, which means that the Zaius support team must make certain updates on the Zaius platform to fully utilize this feature. Please consult with your CSM to get those changes made prior to initializing this feature. In the Zaius Localizations panel, switch the Enable/Disable dropdown to "Enable"
Zaius Engage has a new option to support double opt-in workflows. To enable this, make sure to set the "Submit Event For Status Not Active" option in the Zaius Engage Configuration. With the "Submit Event For Status Not Active" option enabled, new users with subscription status 2 ("Not Active") will trigger a "newsletter" event with action "email_submitted"
Users can configure an Event Triggered campaign to allow the user to opt-in, and use engagement with that campaign as a filter for their regularly-occurring sends. Your Zaius CSM can help set this up. To add a coupon code in an email in Zaius, you need to add the below liquid add set the rule_id as the ID for the coupon code you want to use. This ID can be found in Magento under Promotions > Shopping Cart Price Rules. Fixed function call typo (getLangcode -> getLangCode). Removed bulk import legacy subscriber states which had no effect in Zaius. Removed unnecessary product listing events which caused significant performance issues. Cleaned up localizations for broader compatibility. Further updated double opt-in workflows against a stricter audit. Added default to ensure visibility in configuration. Added product availability field which is populated using the Magento "getIsSalable" function. Hotfixes for tracking live updates to products when using new localizations feature. Hotfixes for Coupon Code Support which addresses a case where coupons were not setting the appropriate type, causing the generated codes to be usable multiple times. Hotfixes for Batch Updates which cover more environments and improve consistency of APIs. Further fix for Customer address import issues causing some addresses to be cut off prematurely. If affected, install the update, then ask Zaius Support to reimport customers for you. Fix for subscriber import and updates ensuring subscribe events are appropriately timestamped - prevents a subscriber synchronization causing all subscribers to appear actively engaged within Zaius. In certain situations, updates (frequently to products) are not detected by Magento, which meant Magento never updated Zaius. This could cause Magento and Zaius to get out of sync. We've added an optional component which will configure Magento to send regular updates to Zaius. When activated, this feature will add columns to Magento databases (zaius_created_at and zaius_updated_at) so that the batch process can send us updates of only new and updated datapoints. While we have not previously identified cases beyond the products feed, this feature is available for products, customers, and orders (but not refunds or cancellations). Please see "Enabling Batch Updates" above for details on configuration. Fix for Customer address import issues causing some addresses to be cut off prematurely. If affected, install the update, then ask Zaius Support to reimport customers for you. Fixed for WS-I compliance for python and .NET clients. The initial data ingest will no longer fail if orders correspond to an invalid Magento store. Zaius works with Magento when WS-I mode is enabled. In-stock information/quantity remaining is now provided for items each time they are purchased. Orders now use base currency, rather than native currency. Fix a regression in support for older PHP versions where the plugin would not work correctly. Every API call to Zaius now submits data via an encrypted connection. For products, Zaius now uses the "media URL" for an item, rather than the cached, rescaled version of an image. Fix a bug where cart abandonment required a static cart creation time (other Magento plugins can change the cart creation timestamp) resulting in problems with cart abandonment campaigns. 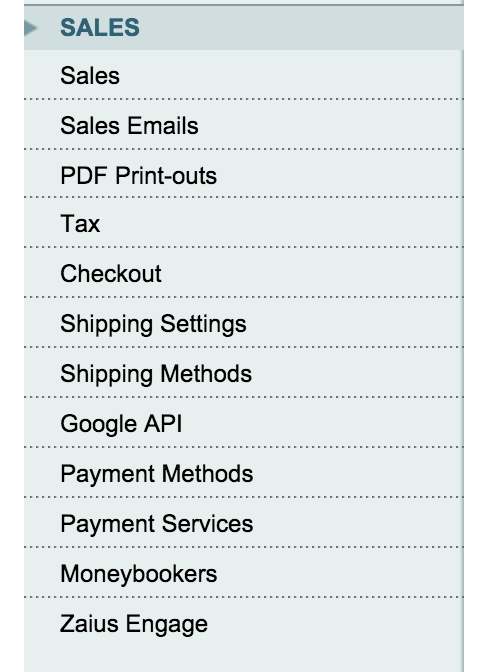 Backend order tracking now correctly handles orders that move directly from "pending" to "complete". Previously, because "processing" was skipped, the order purchase event was not being sent. This only applies if the "Track Orders on Frontend" option is turned off. Orders are now tracked when the order moved into the "processing" state, rather than when it is created (only if the "Track Orders on Frontend" option is turned off). Bug fixes related to posting of backend orders and product entities. Default orders to be produced via the Magento backend, rather than relying on the post-order page fully loading. Fixed order tracking bug that was causing multi-shipping checkouts to fail. Added safer handling of potentially missing internal data fields. If you are having trouble with the checkout process not completing, this should fix the issue. Explicitly reverts to anonymous mode upon customer logout.